By 2050, it is projected that the world’s urban population will grow by 2.4 billion from 2015, with the growth concentrated mostly in Africa and Asia, creating unprecedented urban energy access challenges, especially for under-served populations. What’s more, the old carbon-intensive model of development undertaken in the global north is no longer tenable, given a greater concern for the health impacts of air pollution and the need to mitigate energy insecurity and climate risks. The latest installment of WRI’s flagship World Resources Report, “Towards a More Equal City,” provides solutions that can improve the health of residents, the environment and the overall economies of cities. Energy is fundamental to economic productivity and livelihoods, and cities have a major role to play in how it is provided and consumed. 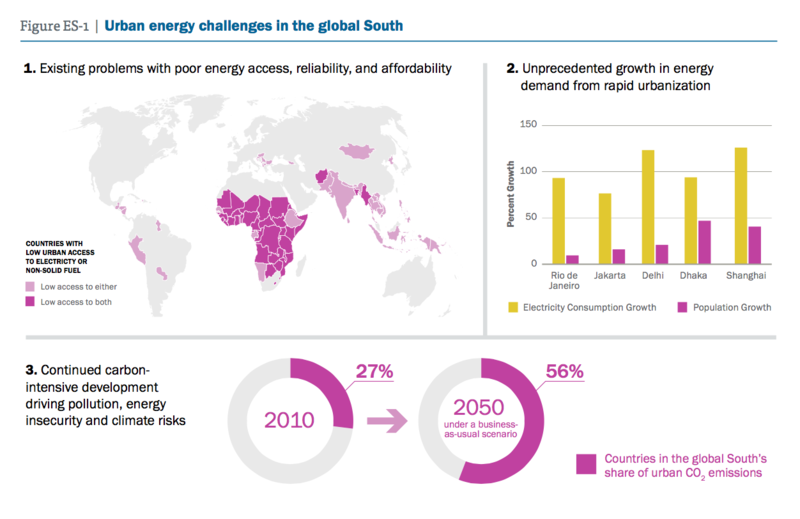 Cities in the global south face three fundamental energy challenges: the urgent need to increase access to clean, affordable, and reliable energy; how to meet increasing electricity demand while addressing inadequate supply and system inefficiencies; and the imperative to chart a new model of development that slows the growth of carbon emissions and is not fossil fuel-intensive. Solutions exist that can both address the needs of the urban under-served and provide economic and environmental benefits to the whole city. 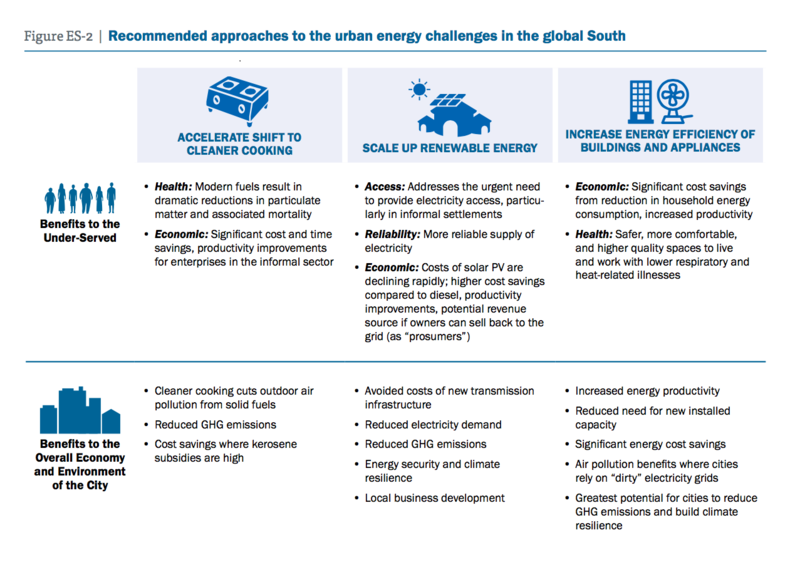 We highlight three solutions in which the city itself can play a key implementing role: accelerating the shift to cleaner cooking; scaling up distributed renewable energy within cities; and increasing energy efficiency of buildings and appliances. These solutions require enabling institutions and governance, finance, and policy, as well as decisions by diverse actors in cities.